The team behind the Wallace and Gromit cartoons have unveiled six new characters - all with disabilities. 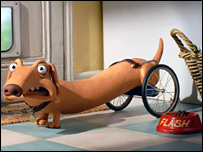 Aardman Animations has based the plasticine animals - including a bull terrier in a wheelchair - on those from its Creature Comforts TV series. The new Creature Discomforts characters will appear in adverts from next week. The animals are part of a campaign by the Leonard Cheshire Disability charity to highlight the discrimination faced by disabled people. Peg the Hedgehog, Slim the Stick Insect, Flash the Sausage Dog, Tim the Tortoise, Spud the Slug and Brian the Bull Terrier can be seen online and in print adverts from next week and in a TV campaign from January. The characters, which feature in four animations, are all voiced by disabled people. Each of the short films end with the message: "Change the way you see disability." Alex Milhaly, 57, is the voice behind Flash the Sausage Dog. At the age of 32, Mr Milhaly had a fall at work which damaged his spine. 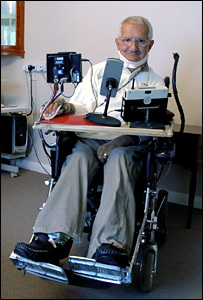 Now a wheelchair user, Mr Milhaly uses a number of computerised aids to help him at home. "I'd just like people to realise that we are real people, we are not brain-dead just because we are disabled. We can provide just as good a service as able-bodied people but we don't get the chance," he said. The director of the animations, Steve Harding-Hill, said it had been "an amazing experience for us all at Aardman". "Taking the real voices and experiences of disabled people and creating animated stories that are informative, entertaining and poignant has been an immense but incredibly satisfying challenge," he added.